The Museum of Discovery, which has its roots as Little Rock’s oldest museum, is currently closed for renovations. First founded in the 1920s by Bernie Babcock in a streetfront store, it later was housed in Little Rock City Hall and for many years called the old Arsenal building in MacArthur Park its home. In the 1990s, it moved to the burgeoning River Market district as an anchor tenant in the Museum Center building. In April 2011, the museum closed for a reimagination of its space in the building. Once it reopens to the public in early 2012, the Museum of Discovery will, for the first time in 85 years have a streetfront entrance. Once inside, visitors will experience Arkansas’ premier science center with exhibits geared to all ages from pre-school up to adulthood. This expansion and renovation was made possible through the support of the hundreds of donors, the tireless efforts of a Board of Directors, the generosity of the Donald W. Reynolds Foundation, support of the City of Little Rock and the vision and leadership of Nan Selz, the museum’s executive director. While the museum is closed, its camps, traveling exhibits and participation in the Arkansas Discovery Network has continued. Special events such as Dino Dash and Uncorked have continued as well. Tonight, the 2011 edition of Uncorked takes place. 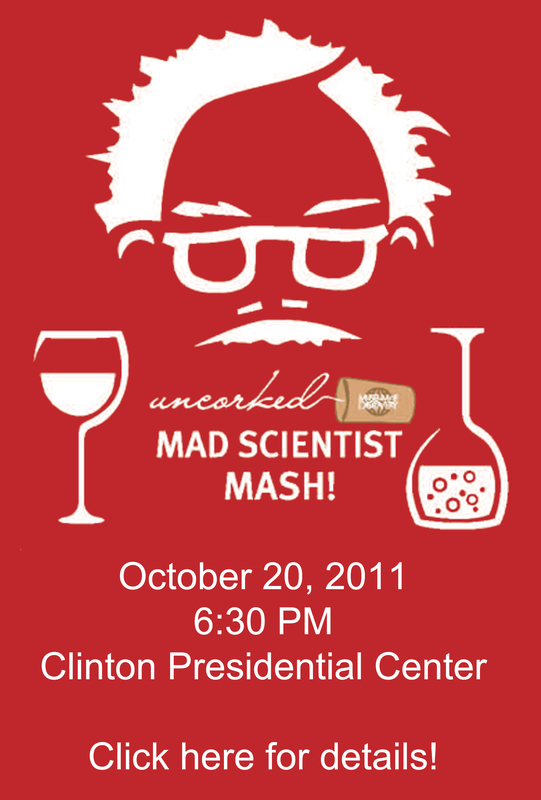 With the theme “Mad Scientist Mash” it takes place at the Clinton Presidential Center, just down the street from the Museum’s location. This entry was posted in Arts & Humanities Month, Museum and tagged Bernie Babcock, City of Little Rock, Donald W. Reynolds Foundation, Museum of Discovery, Nan Selz by Scott. Bookmark the permalink.